Think challah is the only Shabbat bread in town? Think again. Master baker Uri Scheft, the man behind Tel Aviv's celebrated Lehamim Bakery and New York City's equally adored Breads Bakery walks you through the the technique for making jachnun in his new cookbook, Breaking Breads. "Jachnun, a hearty, heavy, crêpe-like Yemenite bread," explains Scheft, "is most often served with grated tomato and spicy z’hug on Saturdays as part of the Sabbath brunch. Observant Jews who don’t cook on Saturdays place a tightly covered pan of jachnun in a barely warm oven on Friday night (or drop the tin in the embers of the taboon) and slow-bake it until they pull it out Saturday and serve it for lunch. This is hearty, heavy eating at its best—eat one or two pieces and you’re happily satisfied for hours. Some people like the caramelized and chewy pieces from the bottom of the pan; others like the soft and dense pieces from the middle. Do remember that it bakes for 12 hours." Recipe reprinted with permission. Excerpted from Breaking Breads: A New World of Israeli Baking by Uri Scheft (Artisan Books). Copyright © 2016. Place the flour, sugar, baking powder, honey, and salt in a large bowl. Add the water to the bowl and stir until the dough is shaggy and the water has been absorbed. Knead the dough in the bowl for 2 minutes (it will be pretty wet and sticky). Set the dough aside at room temperature to rest for 5 minutes. Slide your hand beneath the dough toward the center so your fingers point up (beneath the dough). Lift the dough from the middle, moving your hand toward the edge of the bowl to stretch it. Release the dough, give the bowl a quarter turn, and repeat 7 times. Cover the bowl with plastic wrap and set the dough aside to rest at room temperature for 1 hour. Lightly oil a large plate. Oil your hand and pat some oil under the dough and over the surface. Grab a corner of the dough and squeeze your forefinger and thumb around it, pushing a baseball-size ball of dough up through the circle made by your finger and thumb. Break off the ball, place your thumb in the center of the ball, and use your other hand to fold the edges over your thumb, using your thumb to pinch down each of the edges as they get folded over. Pinch all the corners shut and then set the dough on the oiled plate, smooth-side up. Repeat with the remaining pieces of dough to make 10 baseball-size balls. Cover the dough loosely with a kitchen towel and let it rest at room temperature for 5 minutes. Adjust an oven rack to the lowest position and preheat the oven to 225°F. Fold a long piece of parchment paper in half lengthwise and place it across the bottom of an 8-inch springform pan or kubaneh pan so the edges of the parchment hang over the sides (like a sling). Heavily butter your work surface and set a ball of dough on top. Butter the top of the dough and use your hands to push and stretch the dough into a very thin—paper-thin—rectangle (stretch it as far as you can without the dough tearing, adding more butter as needed to prevent tearing—but don’t worry if it tears). Fold the left side of the rectangle over the center, lightly butter the top of the fold, then fold the right side over (creating a simple fold) and lightly butter the top. Starting at a narrow edge, roll the dough into a tight cylinder. Set the cylinder in the parchment paper–lined pan, perpendicular to the length of the paper. Repeat with 3 more balls. Once the first layer of the pan is full, set the next layer on top of the first, across the first layer in a crosshatch pattern. Place the final 2 cylinders around the edges of the pan. Butter another doubled sheet of parchment paper and place it, buttered-side down, on top of the dough. 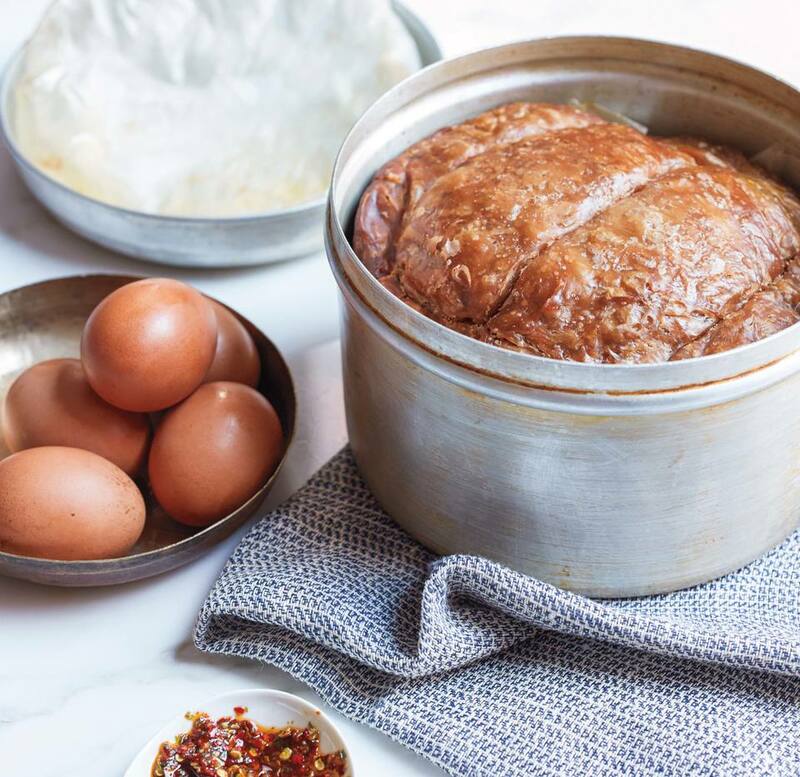 Bake the jachnun overnight, for 12 hours. The next morning, remove the jachnun from the oven. Uncover the pan and discard the parchment paper. Place the jachnun on a platter and serve.